The square does not have much historical appeal. 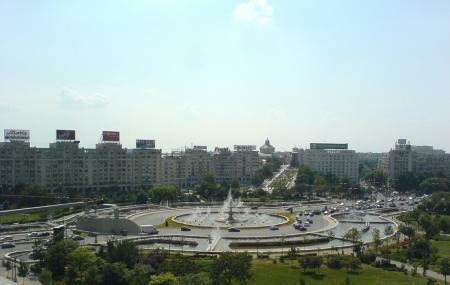 Its claim to fame is relatively simple - That it is one of the largest squares in the country. Most of its traffic comes from the fact that it is one of the city's main transportation hubs, containing the Piata Unirii metro station, as well as being the central destination for many buses. There is a small park with fountains and benches at the square, where commuters often hang out. In the neighborhood you will also find Unirea Shopping Center, the Cocor department store and the famous caravanserai Hanul lui Manuc. A massive Christmas tree is decorated at the square during Christmas. How popular is Bulevardul Unirii? People normally club together Lipscani and Patriarchal Cathedral while planning their visit to Bulevardul Unirii.